The Ladies' Cedar Park Full Zip Vest features fabric mock neck, tonal stripe to create an amazing product for any trade shows. 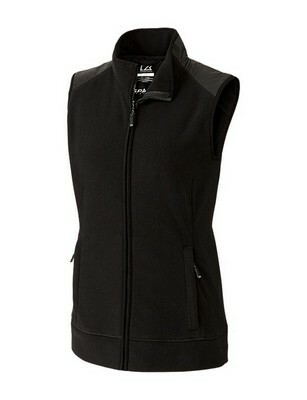 An amazing combination of weather protection and soft-feel warmth engineered into a tapered ladies outfit, the Ladies’ Cedar Park Full Zip Vest is sure to impress anybody with its stylish design and comfortable fit. Pure polyester Spark systems style jacket features end on end tonal stripe brushed fleece for perfect layering all year round. 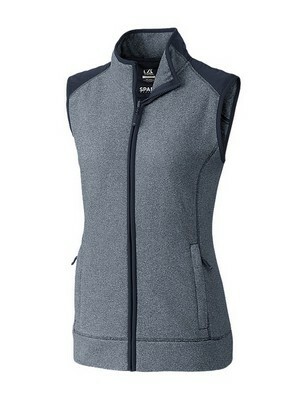 Self fabric mock neck and hybrid piecing on collar, shoulders and back yoke keep wind and water away so that you can give flawless performance. Decorative cover stitch detail and concealed full zip add a nice touch to the attractive outfit available in variety of bright color options. Select your color and customize it with your brand logo to make an irresistible promotional giveaway that gets you lot of love of attention.